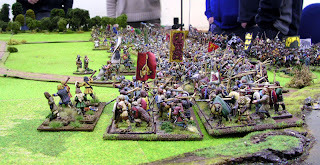 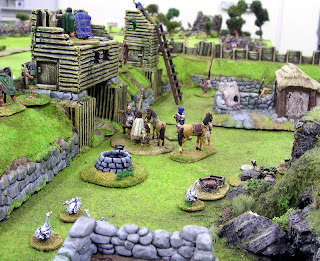 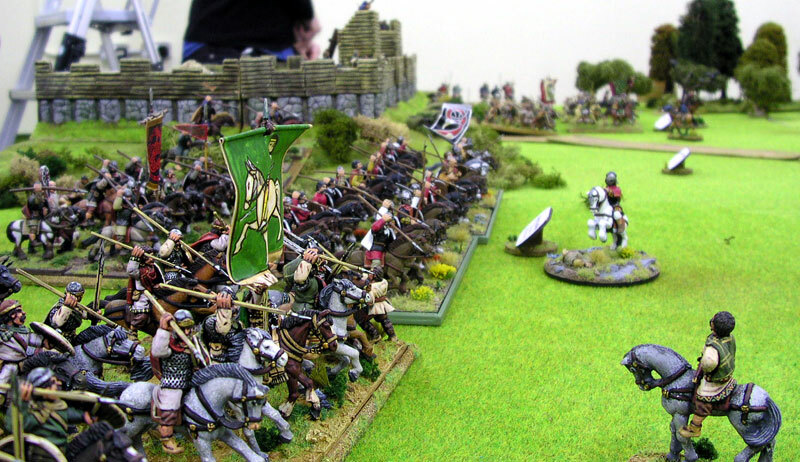 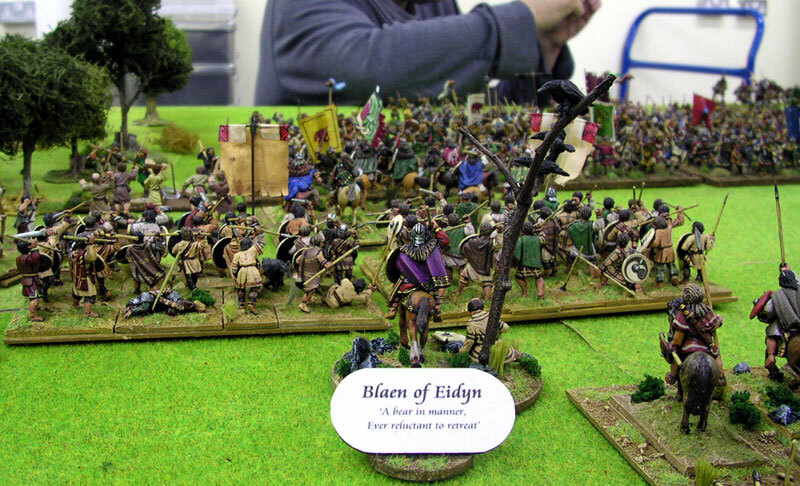 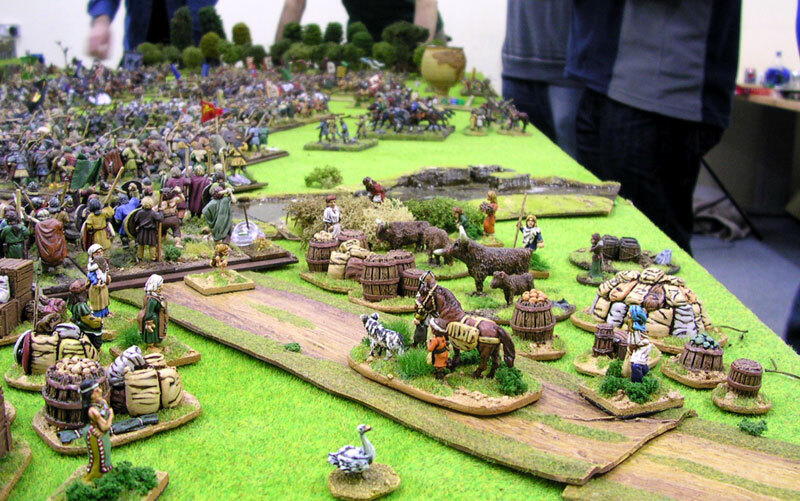 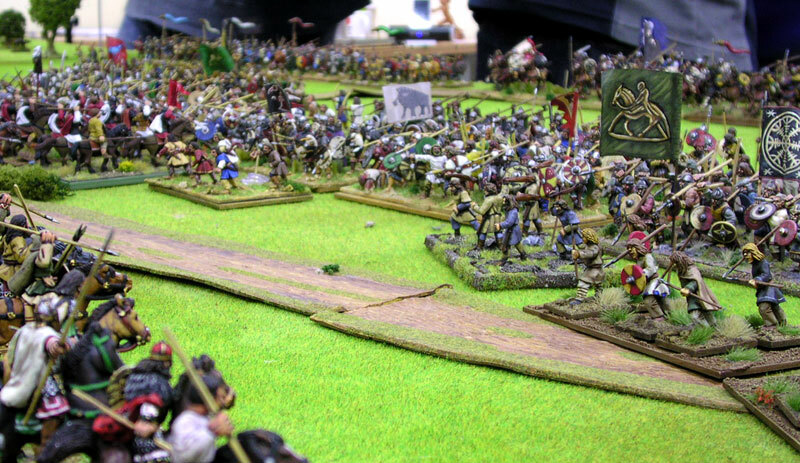 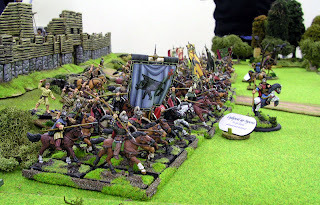 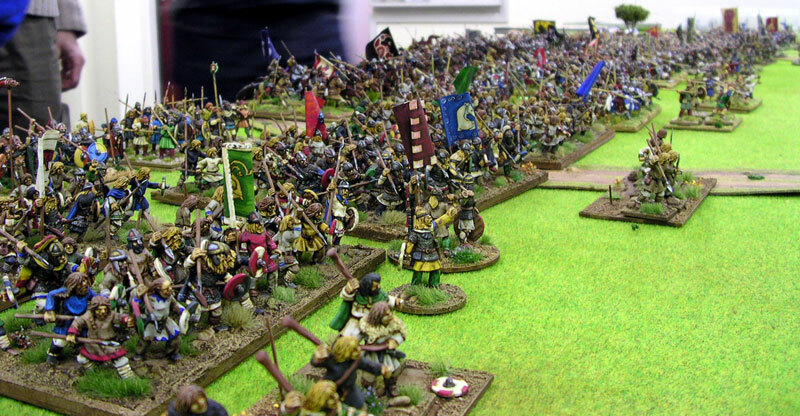 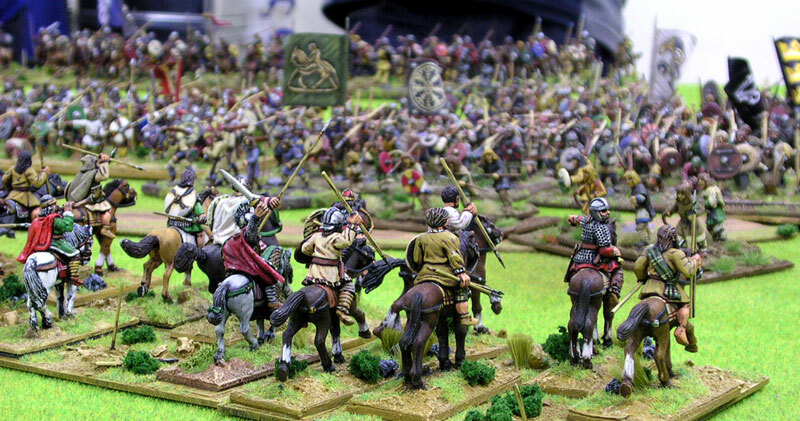 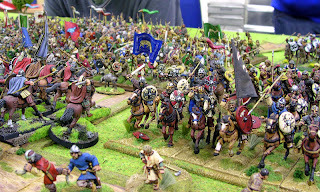 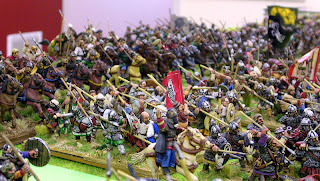 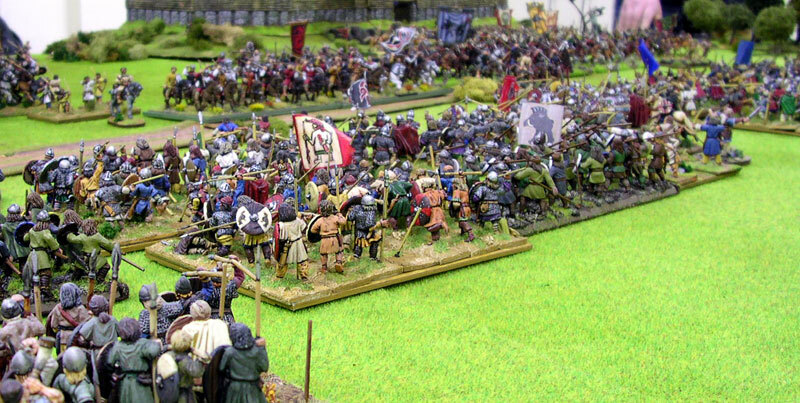 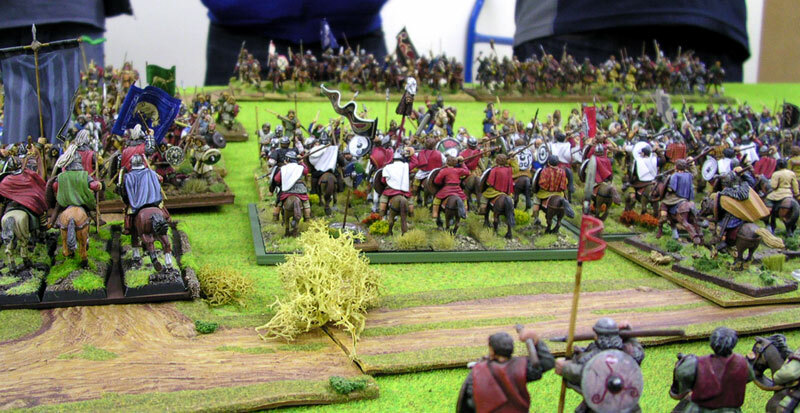 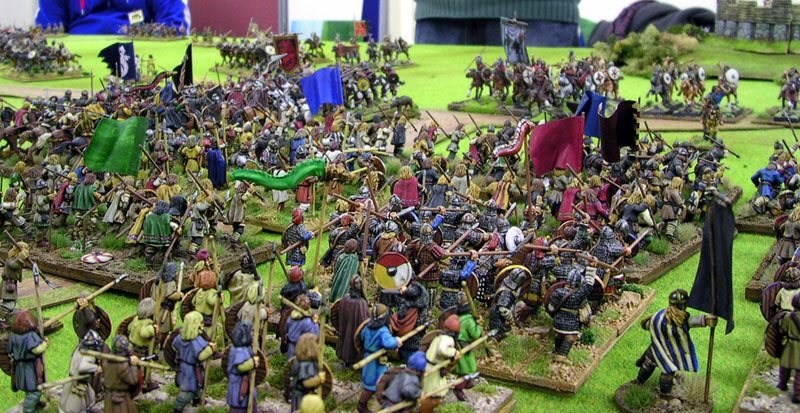 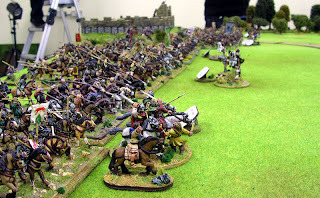 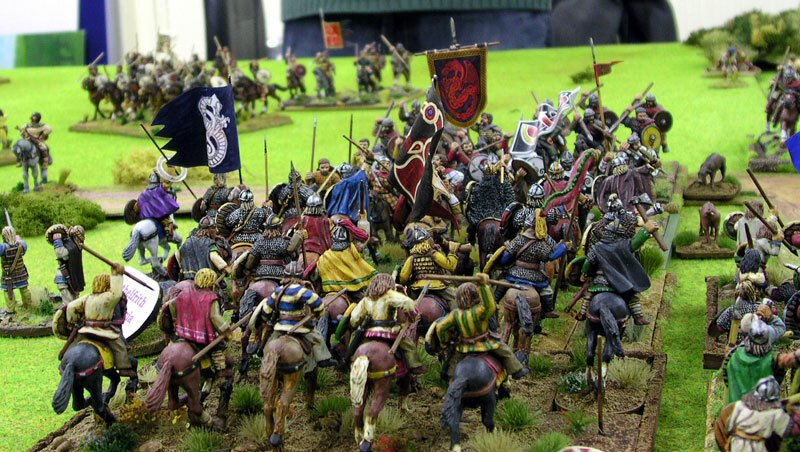 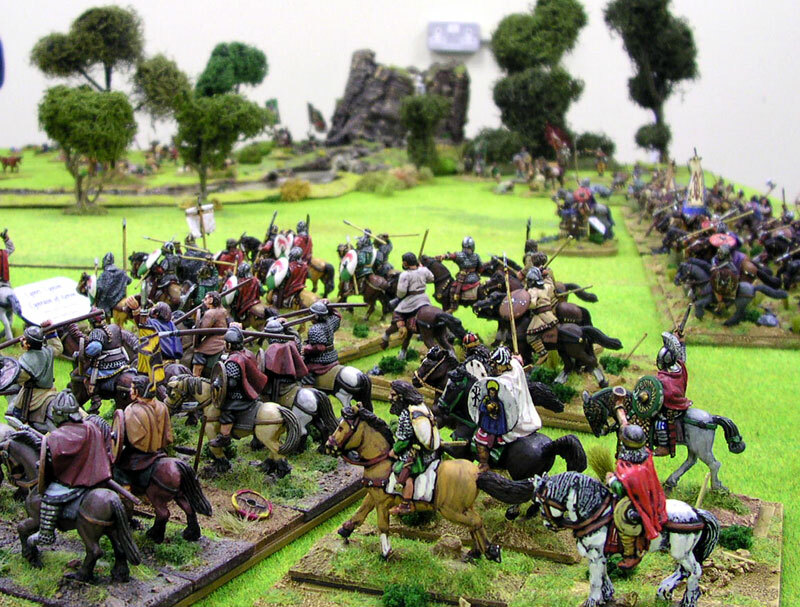 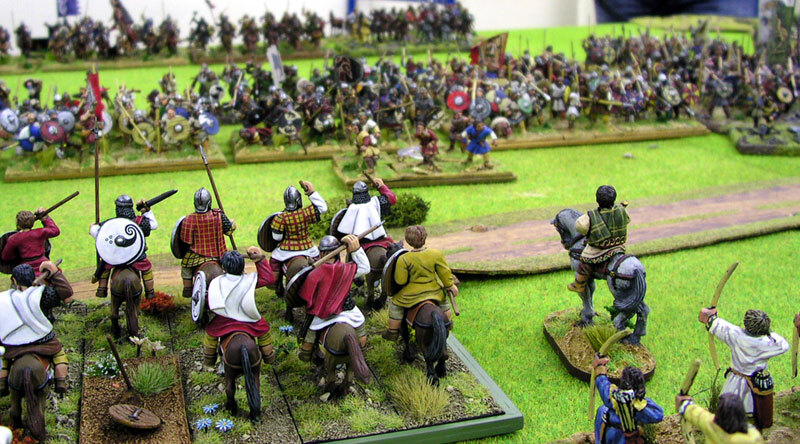 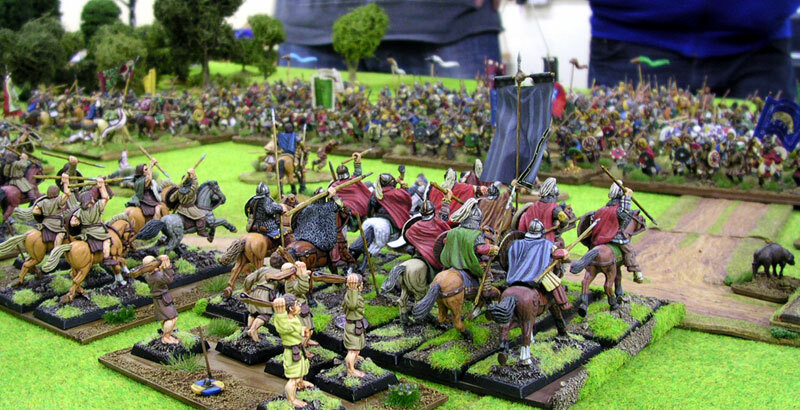 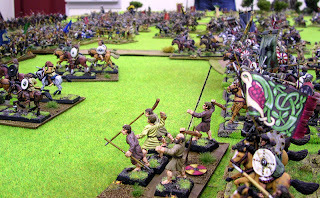 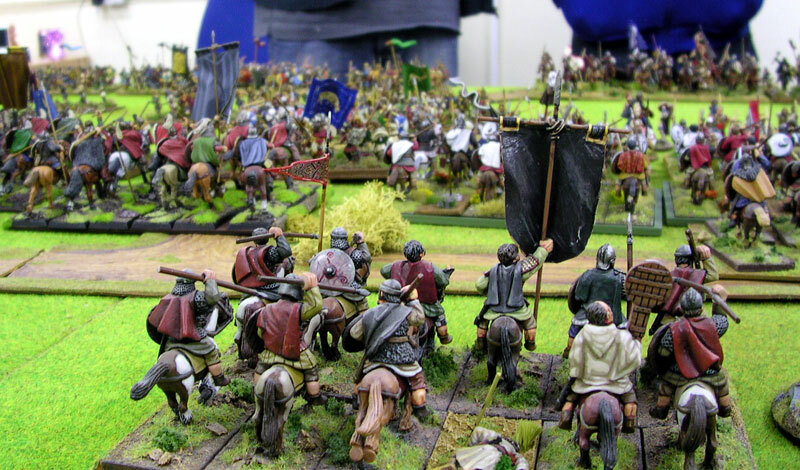 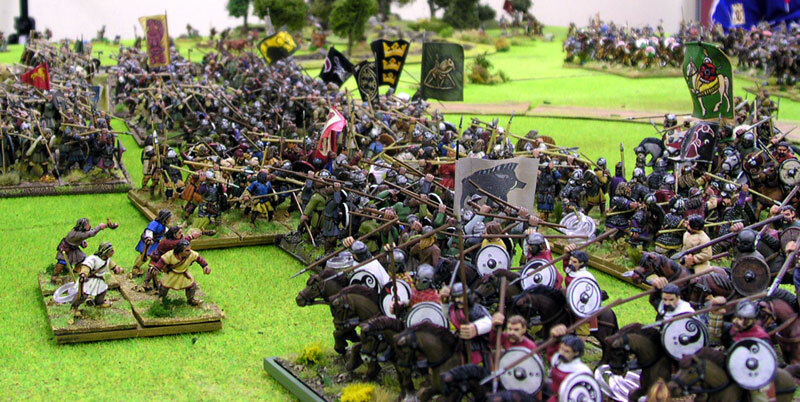 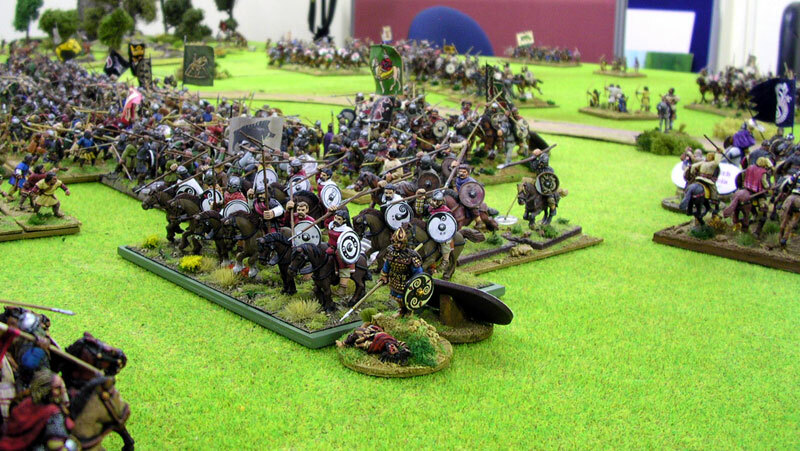 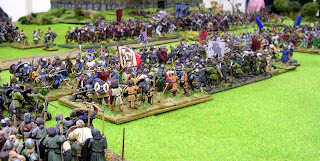 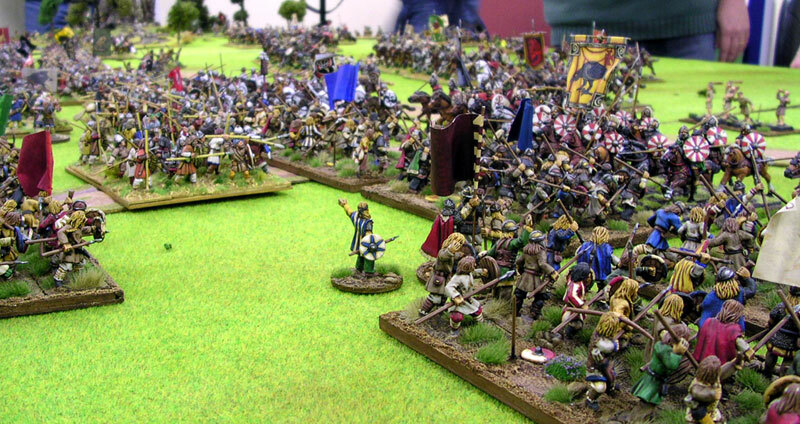 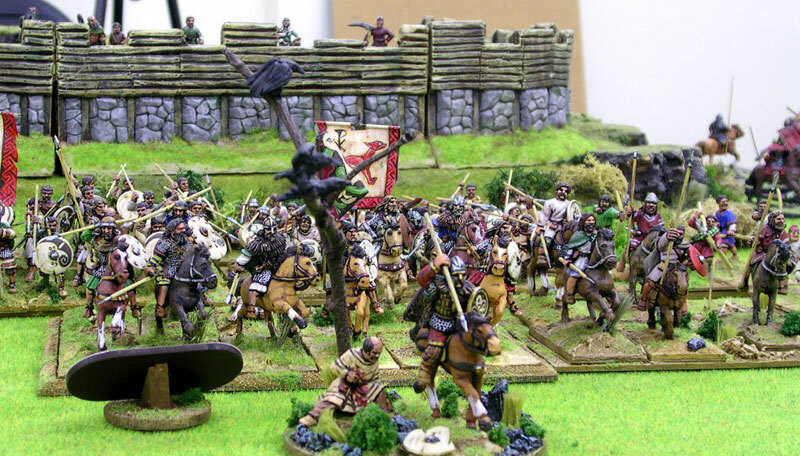 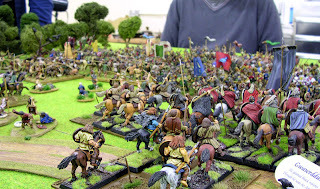 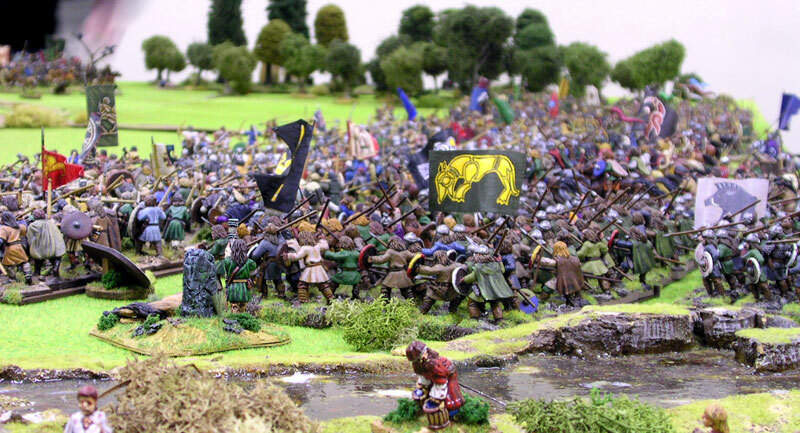 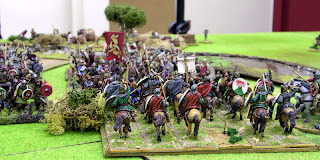 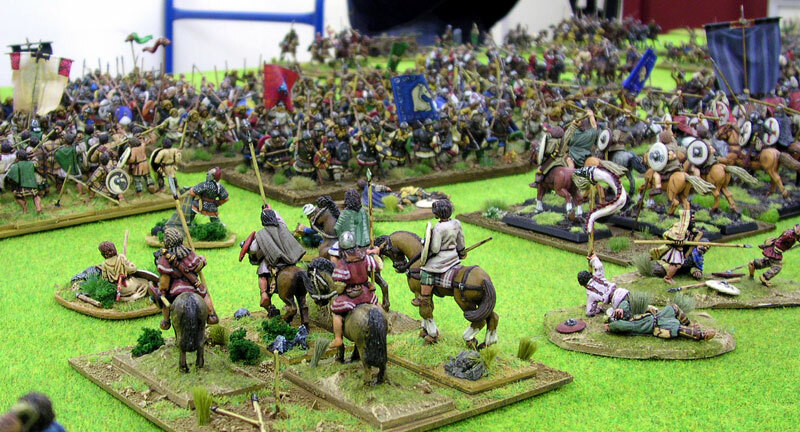 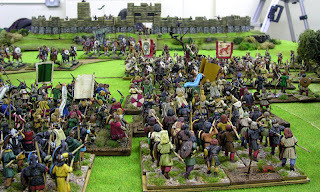 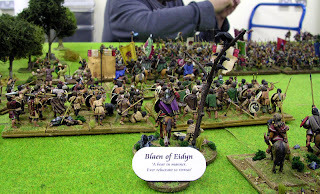 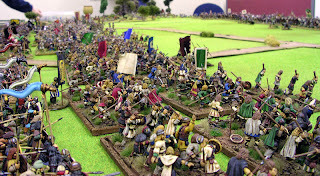 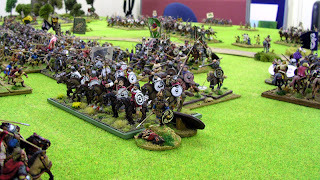 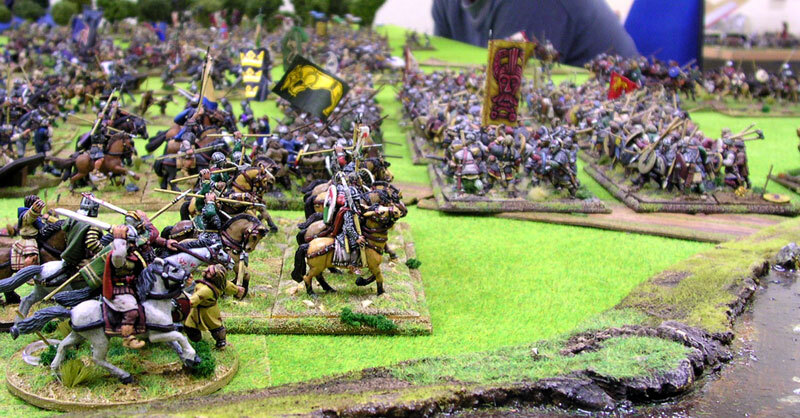 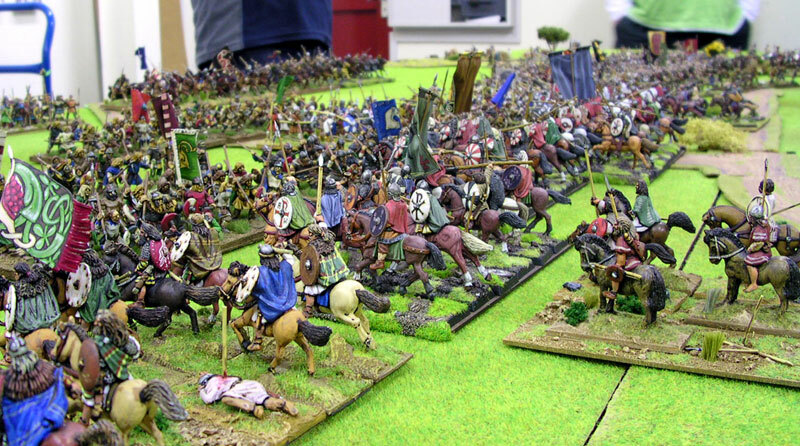 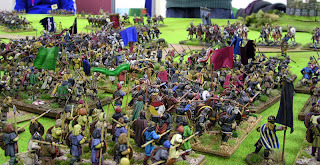 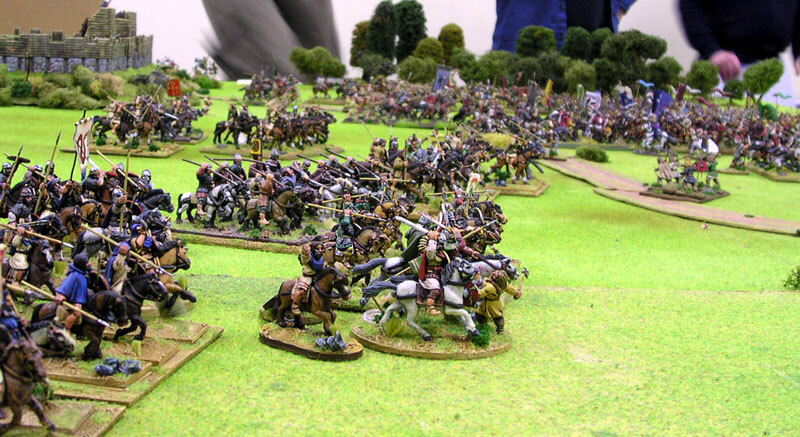 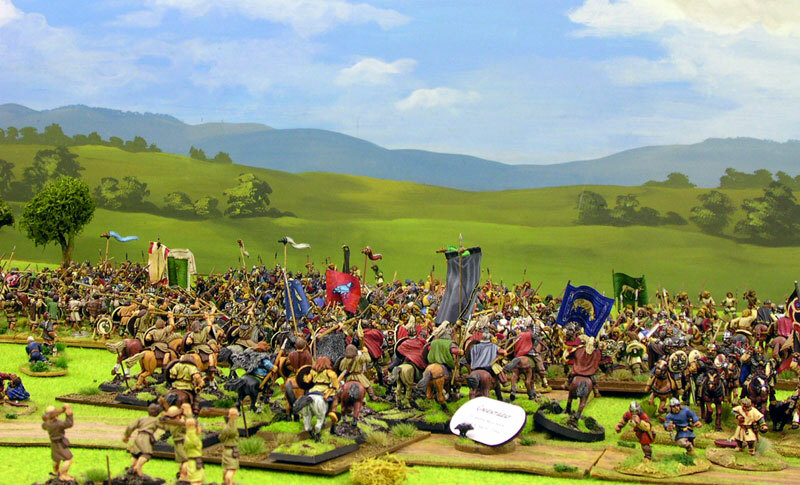 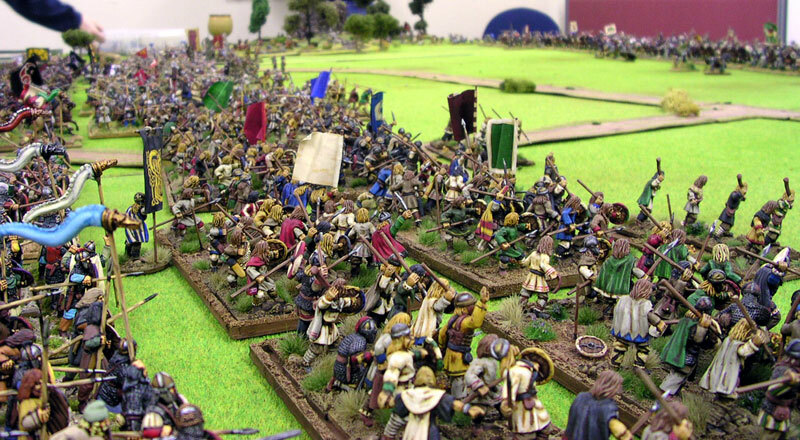 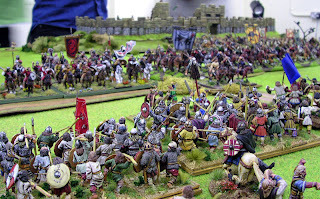 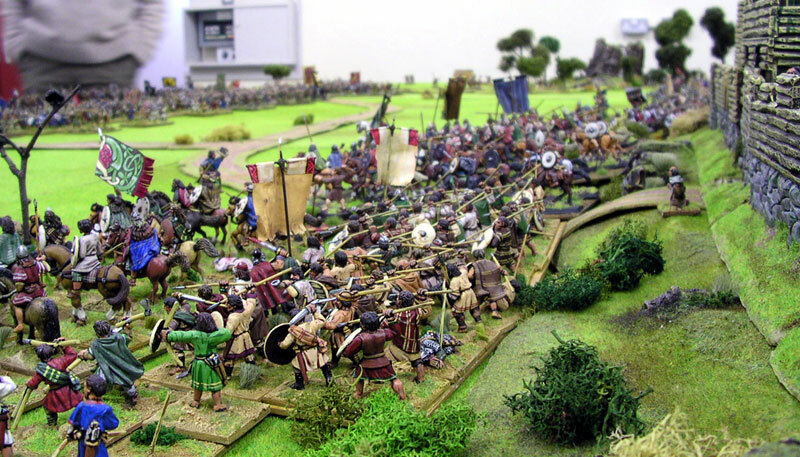 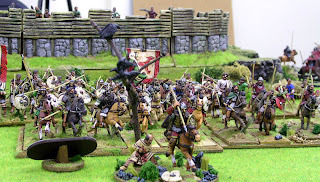 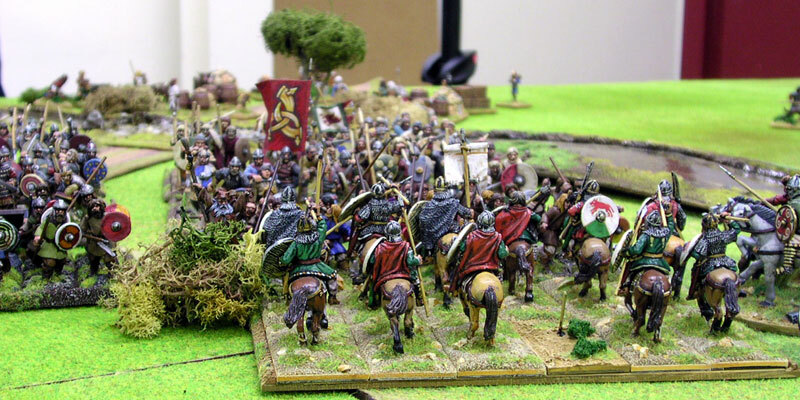 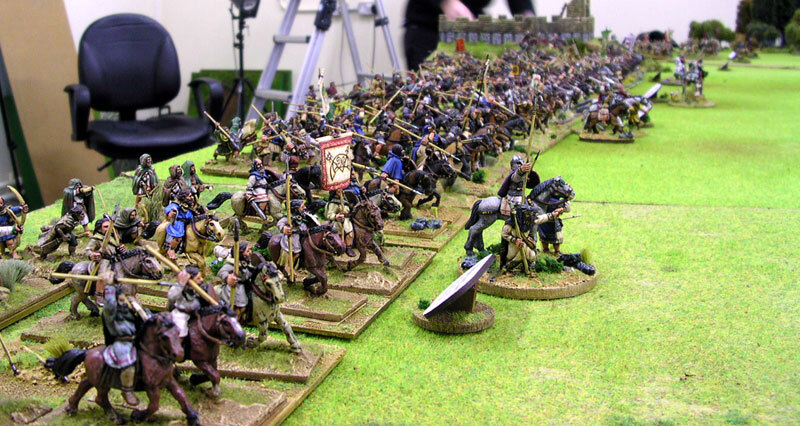 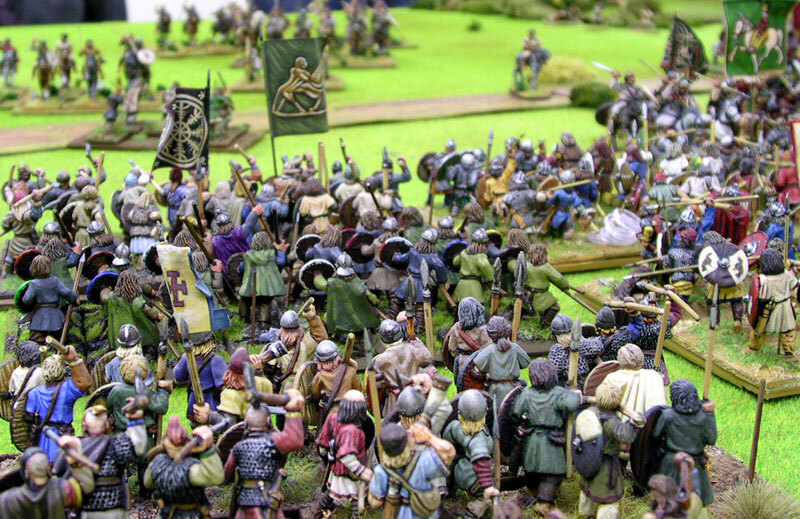 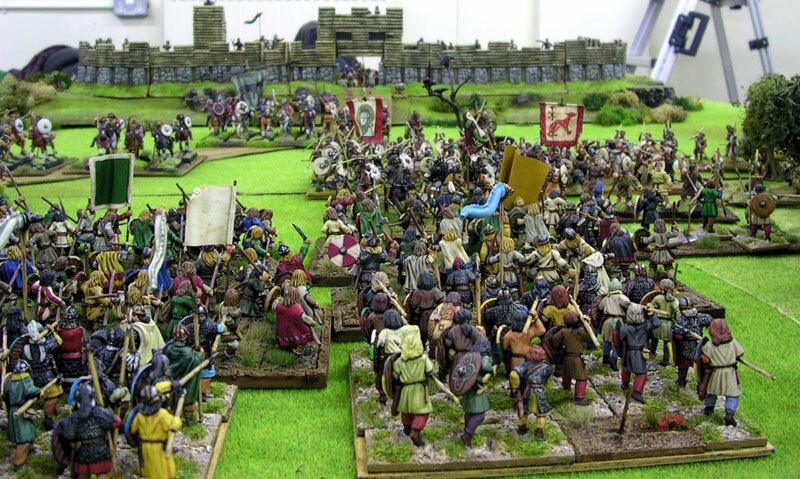 As I've already mentioned I played in a really big wargame earlier this year, first in a secure bunker in Nottingham and latterly at Partizan, in which we re-fought a version of the battle of Catraeth as recorded in the early poem Y Gododdin. 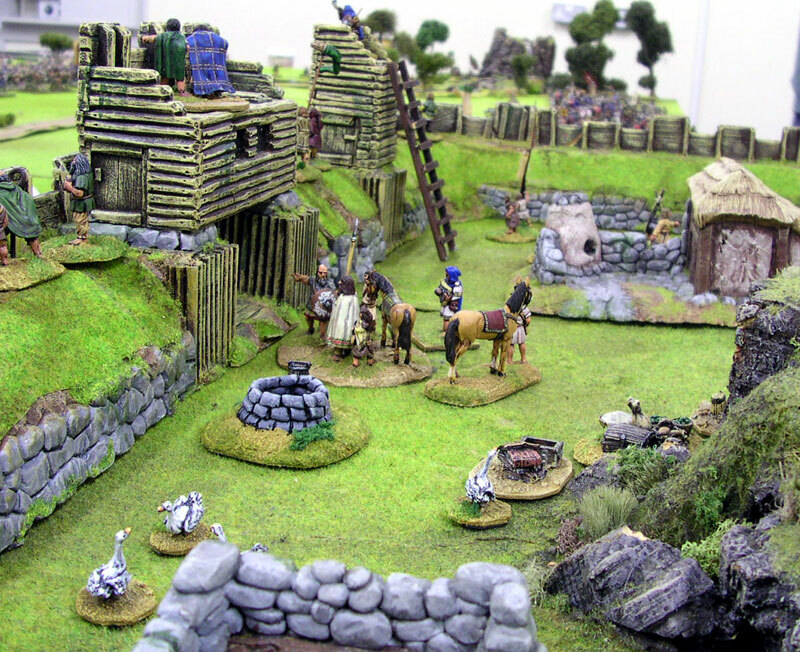 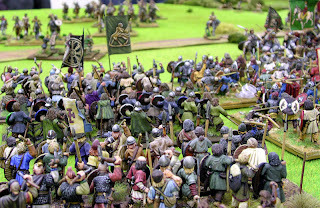 The original version was played as a battle report for inclusion in the bumper 300th issue of Wargames Illlustrated magazine. 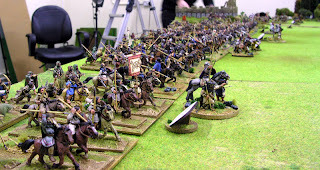 So the pictures and thought have been under embargo until now. As the magazine covers the detail of the game I'm not going to post a full account of how it played. 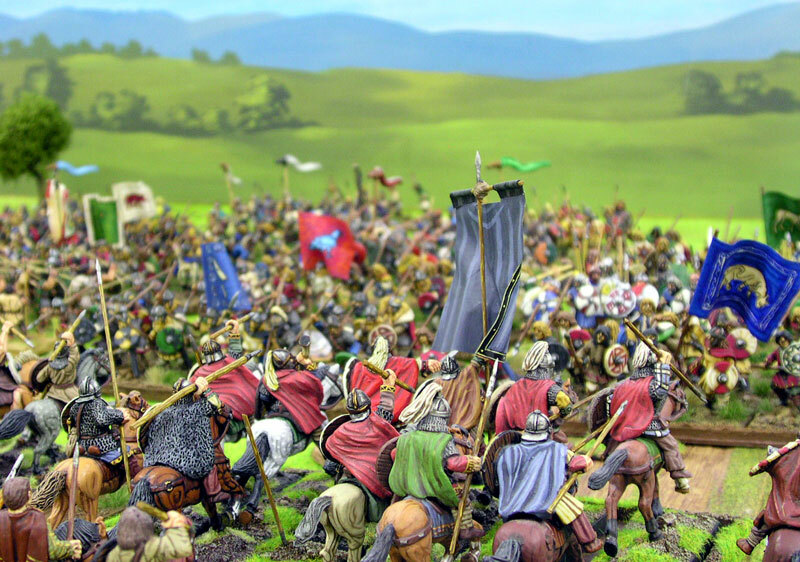 If you want that go and buy a copy (it's a massive issue with loads of great stuff in it, so I'd recommend it even if I wasn't in it). However I did take almost seventy pictures of what was a hugely impressive set-up, so it'd be remiss of me not to share them. 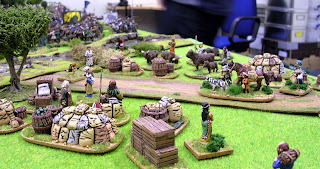 Myself and Scrivs were the two chief play-testers of the scenario and special rules with James as we built up to the big day (and if you're interested you'll find some reports back in December and January on this blog). 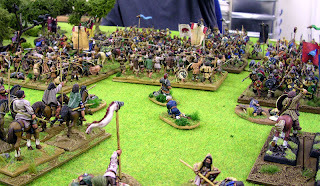 We're both Saxon players and had taken the role of Saxons in all the warm-up games however on the day of the game it was felt that one of us should play on each side, with James acting as Umpire. As a result I ended up in the centre of the British line with a load of beautifully painted (by Matt Parkes no less) cavalry at my command. 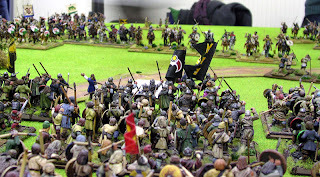 The scenario was based very much on the version of events re-told by Rosemary Sutcliff in her lovely book the Shining Company. 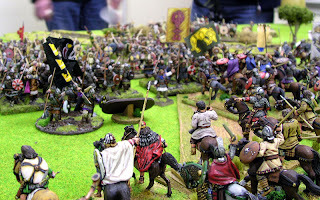 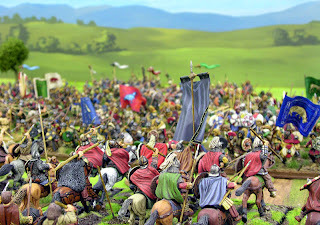 As I'd only just read it, and knew James had prepped the scenario with reference to the book I played very much in character with that and led my cavalry in a suicidal headlong charge. On my left Andy had some terrible dice rolling which stymied his plans and Steve played a sensible tactical game. The upshot of which was I piled up boatloads of Glory (special victory points award for heroic and characterful actions - see the magazine for a more detailed explanation of how this worked) early in the game and was able to cling on for a narrow personal victory despite getting almost all my men killed. If that lot has whetted your appetite, the official extra pictures can be found over on the Wargames Illustrated website. 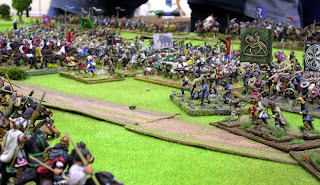 I know I've said it before but it was a truly splendid day of gaming with some great chaps and it looked fantastic. 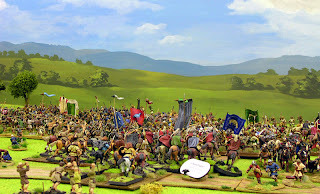 Please go and buy WI300 if you want to see more and read the official explanation.